Jo Morton is back with another gorgeous book—and it just may be the first time you’ve seen her absolutely admirable appliqué! In Jo’s latest book, Jo’s Floral Album, you’ll stitch spectacular blocks featuring beautiful blossoms, twining vines, luscious berries, and other motifs that define traditional Album quilts. 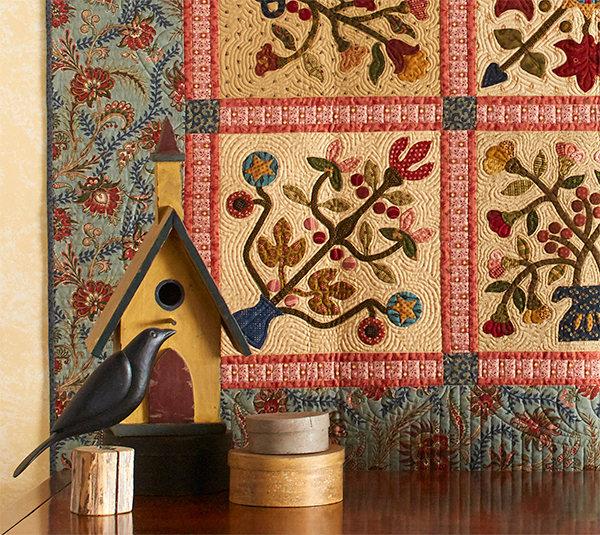 Make blocks one after another, or set a relaxed pace and sew just one block each month—by year’s end, you’ll have a breathtaking quilt to display, give, or save as a family heirloom. Jo’s Floral Album: finished size 57½" × 57½". Jo’s student-approved instructions for back-basting appliqué (no freezer paper or templates required) will help you achieve appliqué perfection. From materials needed to final finishing steps, all you need to create this stunning quilt is inside, including full-sized patterns (no copy-store trips for you). We are excited to welcome Jo as a guest writer today, here to tell us more about her amazing Album quilt. But before we do . . . FABRIC GIVEAWAY! Our friends at Moda Fabrics sent us a lovely Layer Cake from Jo’s line, called Timeless, to give away to one lucky winner! Learn how you can win the Layer Cake plus a copy of Jo’s Floral Album at the end of this post. All right, NOW we can welcome Jo! I’m a fan of appliqué (yes, I do make more than just patchwork quilts), but I struggled with it for some time. I found that if I appliquéd frequently, my work improved; but then I would go back to patchwork, creating a vicious circle of needing to improve my appliqué skills all over again. I was fortunate to take a class from Jeana Kimball about 15 years ago. I drove to Liberty, Missouri, for the class, a little more than two hours from my home. But it was worth the drive. In class I learned Jeana’s “back-basting” prep method for needle-turn appliqué. I was immediately hooked! It’s the only method I’ve used for appliqué since. Now I can go for months between appliqué projects, pick up needle and thread, and feel confident in my workmanship. In Jo’s Floral Album, you’ll find all the steps needed to learn back-basting appliqué—along with full-color photos of the process—so you too can be successful with this technique. The blocks for Jo’s Floral Album were inspired by blocks from at least three antique quilts. I changed and/or simplified some motifs, because I’m not a fancy person. I make quilts that we hang or use in our home, as we have a mix of antique furniture from our trips east to Ohio and Pennsylvania, along with period reproduction furniture. I make quilts for me and then I share them with you, because traditional quilts are always in style. In Jo’s Floral Album, you’ll find full-sized patterns for the 12″ finished blocks. There are also page-sized color photos of each block. If one is so inclined, one could trace those to make an 8″ finished block instead. These blocks were completed in 2012. They rested with the gorgeous border fabric for some time, due to other obligations. Finally, last year, I took the time to square up the blocks, assemble the top, and send the quilt out for beautiful machine quilting. I’m looking forward to hanging it in our home come spring—like many of you, I have Christmas quilts going up soon—decked on the walls and beautifully displayed in stacks, on beds, and on tables, of course. I think you’ll enjoy making this Album quilt. Take your time and enjoy the process. That is why I quilt. 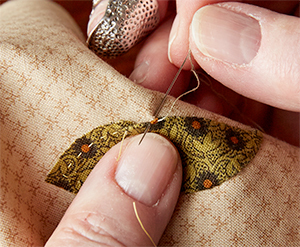 There’s nothing like the rhythm of needle and thread. It warms my heart and soul. Jo, we always love having you as a guest writer—thank you for sharing all the heart and soul you put into Jo’s Floral Album. What would you do with your finished Album quilt? Snuggle under it—that’s what quilts are for! Hang it on the wall for EVERYONE to see. Forever. Put it on display for special occasions; then leave it in my will for someone who will appreciate it! Share your answer in the comments to be automatically entered into the drawing—we’ll choose a random winner one week from today and let you know by email if you win. Good luck! And if you’re ready to start your own appliquéd heirloom, order Jo’s Floral Album today at our website, ShopMartingale.com. We’ll email you about your prize, Myra—congratulations! I use my quilts or give them away. I also prefer piecing and need to practice applique when I go back to it, so I am very interested in this book. And of course I love fabric. Hang it up for sure! I’d hang on a wall. I would definitely hang this quilt on a wall — such beautiful work! Thank you for this giveaway offer. depending on the finished size I think this is one for the wall but I have limited wall space due to built in shelves and a lot of windows so if that wouldn’t work I would be snuggling with it. I love Jo’s fabrics and patterns. Jo’s Floral Album is beautiful! I would love to learn her back basting method and make it. I would hang it on the wall. Thanks for the great giveaway! If I made this quilt, it would be hanging in my dinning room. Going to hang in the foyer of my new house! Hopefully this spring! 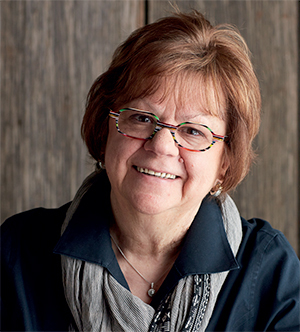 Jo Martin is one of my favorite authors to go to for inspiration. My finished album quilt will be given to one of my special nieces to love and cherish. Since I have two nieces, I guess I will need to make two! I would hand it for a period of time to enjoy the work but then use it myself. Thanks for another great give away. If I had a finished album quilt, I would first do a little celebration dance since I’ve had one on my "to do" list for years. Then it would probably be displayed on my wall for a while just to enjoy it! I would definitely snuggle under it, as that’s what quilts are for, at least big ones! If I made it smaller, using only part of the squares, I would be hanging it for all to see. I love this book! If I was able to finish this quilt, it would have a place of honor on the wall in my living room. I love that Timeless fabric, also! I love the quilts of Jo Morton. I love to applique and this new quilt would look oh so good in my home. 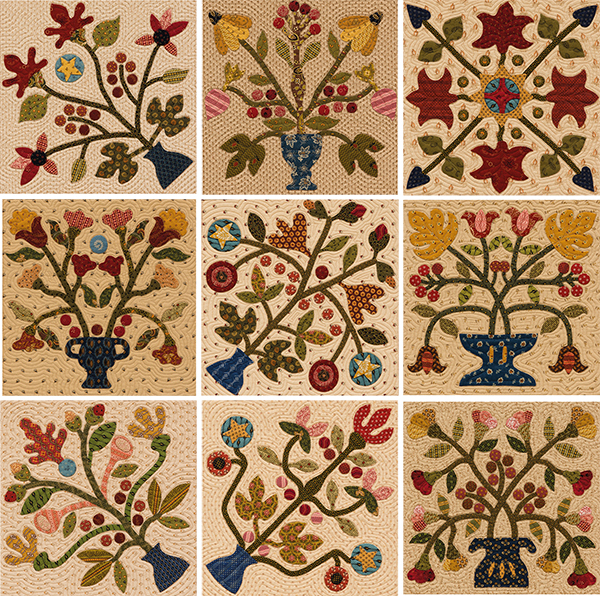 This is a beautiful collection of blocks and I would love to complete an applique masterpiece. I think I would hang this quilt in my entry, wait to see who admires it the most and then give it to that person in my will. There are some quilts you want to see used frequently and some you want to see preserved. I would hand this one on the wall. It’s beautiful! Wow! What gorgeous fabric and what a stunning book and quilt! I would hang this quilt for all to see and THEN leave it in my will to someone! Lovely quilt! This quilt would definitely be one to hang on the wall to be admired. I like to rotate my quilts that I use for wall hangings. Thanks for the chance to win the book and layer cake! hang it on the wall and invite every one in to show it off and leave it in my will to my granddaughter because she loves my quilts more than anyone else. I would hang it on the wall for everyone to see! I’d put it on my guest bed (out of the sunlight, of course). And then I’d put it away for someone special, designated in my will. Snuggle under it–and leave it on display between naps! I would probably hang it on the wall forever, because the applique would take a long time and I would be very proud of it. I would do all three, snuggling under it for a time just to see it and be satisfied that I did my best, hang it in my living room for all to see ( my Mah Jongg group, cc club and my Hand and Foot gang) and then leave it in my will to either my daughter or daughter in law. One quilts because I taught her and one does not, but I have hope! I would hang it and enjoy for awhile; then consider using it as a fund raiser for our church quilt group where we make quilts for kids. Not only would I learn a new technique to create this beautiful quilt I want to display this lovely creation in my front foyer for all visitors to see/admire. This sampler is awesome! -Jo Morton is a talented artist/quilter. I have a quilt rack on the wall in my foyer that will be PERFECT for my finished Jo’s Floral Album quilt. Thanks for the chance to win the book and fabrics!! I absolutely LOVE Jo Morton’s designs!! This book looks lovely. I would hang my finished Album quilt on my wall and admire it every time I walked by. I love everything Jo Morton. Thanks for the chance to win. Use it as a spread on my bed. I would display it on a quilt rack and then use it to snuggle under on cold winter nights. Hang it on the wall for EVERYONE to see. Forever. However, I would have to remove present quilts, and must admit my wall space is limited. If I made another one I’d just have to clear off a wall. snuggle under it or hang it! I like to use my quilts myself or to give them away to people who will appreciate them. Oh what fun! I would put this quilt on my bed as an accent piece. I would snuggle under it. I love quilts and believe that they should be used on a daily basis. I would proudly hang it on the wall for everyone to see and enjoy. Love, love, love it!!! I would love to snuggle under it and I would will it to someone who appreciates the work put into it. Hang it on the wall for EVERYONE to see. Forever. Of Course! Hang it in my hall to enjoy every time I pass by. I am a beginner. This looks like a book full of beautiful patterns! Put it on my bed!!!!! for sure, it would hang on the wall! I love and adore applique’. I would definitely hang it on the wall, not necessarily to show it off, but for me to enjoy. It would bring a smile to my face every time I saw it! Thank you for this amazing opportunity! I would alternate between hanging the quilt for all to see (we need to share) and snuggling under it. Too, too pretty. My quilts will all be left to my two daughters. I know thry will be loved and well csred for. Beautiful. I have done only one small needle-turn project, but found it so relaxing! I would make this for my sister who has bad arthritis now and can no longer make the beautiful things she used to sew. She told me the quilt on her bed is getting worn and she would like to replace it! Perfect opportunity for me! Thank you. I would definitely snuggle under it! It would have a place on my couch, just waiting for a time of need! If I finished the Album quilt and it looks good, I would hang it on my wall to remind myself each day that I now can do applique and also to give myself joy. This one would definitely go up on the wall in my front entrance for everyone to admire. I enjoyed this post with Jo, thank you. My quilt will hang on the wall in a prominent place. My favorite places are the wall space over my couch and the wall space at the end of my dining room table. This way my husband and I can enjoy them every day and share them with others when they visit! I would snuggle under it. I would enjoy seeing it hang in my home knowing my son or daughter will be enjoying it after I am gone to my Heavenly home. Wow! I would love to have that on my quilt wall! I’d put it on display for special occasions; then leave it in my will for someone who will appreciate it! I would hang it on the wall. Jo’s fabrics and patterns are a favorite of mine! I would hang that quilt on my living room wall. Beautiful masterpiece ! I’d probably hang it seasonally. Love all of Jo’s work and fabrics! I would do all three! Quilts are meant to be enjoyed, keep our hearts warm hopefully give future generations a hint of what gives quilters joy and peace in their lives. Beautiful quilt. I would make this and hang it in my entry for everyone coming to admire. I would also enter it in the guild quilt. Only one person in my family loves quilts as I do, so I would leave it to her, my granddaughter, Haley. I would hand this quilt on the wall for all to see. It is beautiful! I LOVE this style of quilt and would hang it on a wall so every visitor could enjoy it – luckily I have three adult granddaughters who would all want to inherit it!! It would be hung in my family room where we spend most of our time!! Without a doubt, I would hang on the wall for all to see and enjoy! This one I would hang on the wall for a while. Then I would just display it on special occasions. One day, I would decide who to give it to. I would lay it over the couch and use it. I would also post it all over Facebook for all to enjoy. I have very little wall space myself so it will be given to my son to hang in his home and I know it will be cared for and eventually go to my granddaughter. My album guilt would hang on the wall for All to enjoy. Many years ago Jo came to visit her friend Connie in Iowa and provided a workshop for our quilt. Love the wallhanging. I would display on special occasions and will it to my children to continue to enjoy. Beautiful quilt! I would definitely hang it in my living room for all to enjoy! Hang it on the wall for EVERYONE to see. Forever. Love Jo Morton’s work!Looking forward to retirement so I can spend more time with handwork! I will lay it across the back of the sofa. It’s a win, win as I get to snuggle under it and everyone who visits will get to see this beautiful quilt! Thanks for the awesome giveaway. I would hang it on the wall forever, and leave it to one of my daughters praying they would appreciate it. I would display it proudly to enjoy and for all to see. All three!!! After it was made I would snuggle under it with my husband. After that it would spends lots of time on the wall and eventually would be part of my will for someone to enjoy! I would hang the quilt in my living room for all to see. It is a beautiful quilt. I would hang it on the wall–it’s too gorgeous to put away and not display it! Hang it up for everyone to see. It is a great piece of artwork. ❤️ Jo Morton Quilts and her color schemes!!!! Would definitely HANG this Quilt in my "new" Florida home!!!!! Thank you for this opportunity and HAPPY THANKSGIVING!!!!! Jo your quilts are so beautiful and these are no exception. Thank you for sharing all your talents. This is a quilt that would show best hung on a wall. And hopefully one of my grandchildren would love it enough to want it when I can no longer enjoy it. This simple yet very elegant quilt will be placed on the bed AND hung during the colder months and along with the rest of my quilts will be gifted in my Trust. Share with a friend – I make quilts to share with others. It’s the process for me! n heirloom piece out of this house for sure! I would hang the quilt on the wall for everyone to see. I would hang this quilt in the living room! I’ve always wanted to learn back basting as I love to do Appliqué. This book seems like the answer! I would hang it on the wall for everyone to see-forever! Definitely hang it up for all to see and admire!! I would proudly display my quilt on a wall for a while, and then take it down and use it on a bed where it’s warmth could be enjoyed. Hang it on the wall in my entry for all to see. Love the colors and fabrics. Jo your quilts are beautiful! My thoughts on quilts are they are lovely to display and look at, but I prefer that someone wrap up in it and know, that they are cuddled by the love that went into making it. Because finishing an applique quilt is such an accomplishment, I would hang it so I could be inspired by both its beauty and its completion. Enjoying it this way would motivate me to work on another, knowing that I have learned and conquered a new technique. I would gift this quilt to my son and his wife they just moved into a new home , what a better house warming gift. I’d probably gift it to my mom and it would be displayed among her antiques for everyone to see. I would hang it on the wall for everyone to see, forever, then I would will it to someone who would appreciate it. Hand it on the wall!! I would make it to display on my quilt wall! I would definitely hang it on my wall for everyone to see! I haven’t done any appliqué yet as I’m a relatively new quilter but I love the look of it and would love to try it! This would give the incentive to try it! Jo has the ability to make me gasp every single time I see her newest design. Just wow. And thank you so very much for the opportunity to win this AND for the amazing books you publish. Love y’all! Beautiful! Now I am going to have to research Jeana’s “back-basting” prep method for needle-turn appliqué, which sounds very interesting :). As for what I would do with the quilt, it’s too small for snuggling, so I think I would hang it in my house until my Mom admired it then gift it to her. I would display my quilt- only if it turns out as well as Jo Morton’s. Would love to learn a new technique- back basting sounds better than fiddling with templates. Love Jo’s designs! Hang it on the wall. I snuggle under quilts with my dog and this is far far too pretty for that! Thank you for the giveaway. A combination of #2 and #3. This is so beautiful and I would love to learn this technique. Lovely quilt! I would use it for myself or gift it! Hang it on the wall for all to see! I would definitely hang it on the wall for all to admire. It gers a bit hot here in VA to snuggle under. Beautiful quilt! Love Jo’s work! Certainly I would hang it on the WALL at the bottom of my stairs so I could look at it every day. Jo’s book would be a treasure. Love appliqué. Hang it on the wall for everyone to enjoy. I would snuggle with first and then hang on my living room wall for everyone to see. I love appliqué and this would be such a wonderful project, especially if I won the beautiful fabric and book! It would hang in my upstairs landing above my 1904 Singer treadle sewing machine. I would have to hang it—the quilt is too beautiful not to be shown off! I would hang it on the wall of my family room for me to see. And everyone else too. Hmmm – perhaps a wall at first then eventually to snuggle. Love hand stitching at night. This would be a perfect long-term project. I would hang the quilt on my wall for everyone to see when they come through my front door and I would leave it to my daughter Andrea, who appreciates quilts. She would be a great caretaker. She’s probably get most of my own quilt treasures. I have the perfect place for hanging a quilt like this. I have yet to see a Jo Morton quilt I didn’t LOVE. I love Jo Morton! This quilt belongs displayed on a wall. It is truly a piece of art. I would use the finished quilt to decorate my house by hanging on the wall as a table topper or hung on a ladder like rack. I would be very proud to show off the completed quilt for all who visit to enter my house to admire!! I would hang it for a time and use it on my bed. Quilts are usable art. 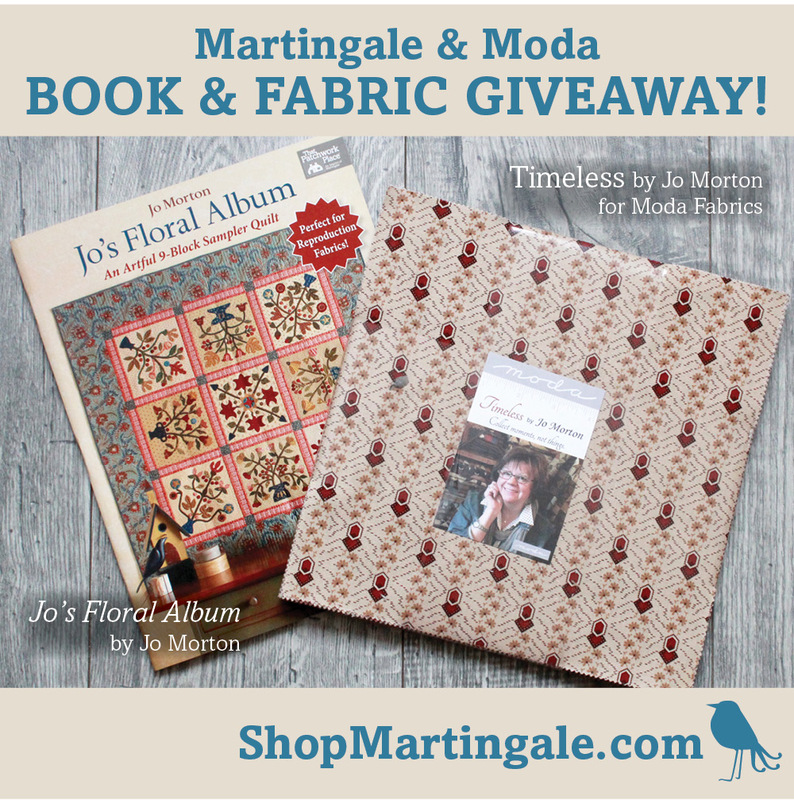 First of all I love Jo Morton’s fabrics and books! I would love to have this beautiful book and make this quilt, it would be so fun to sit in the evenings doing this stitching! I would probably hang this on a wall for everyone to see! I would hang it in my bedroom so it would be the first and last thing I see everyday. Love it with every stitch I took! I would love to have this beautiful quilt. I would either hang it on a wall to share with everybody, or put it on a table, where I could enjoy and study up close. That would be a nice thing. I would definitely use as a wallhanging, so everyone could see it, especially me! Thank you for this chance to win. I would probably give it to my sister who really appreciates quilts and has a knack for displaying things so they really look their best. Maybe I would make two of one of the blocks and make it into a wall hanging or pillow for me to enjoy! I’m a relatively new fan of Jo Morton’s and I have to say, this quilt is stunning. I would hang it and also put it in my will and designate it to someone that would appreciate it. I love that Jo uses reproduction fabrics when she creates all her beautiful quilts. I would snuggle with the quilt. I love applique, and would love to learn this method. Decorate the walls for awhile and then snuggle under it or give it away to someone I love! Thanks for the giveaway. Very exciting opportunity! I would snuggle under it. That’s what quilts are for, but I would only use it on special occasions when I need a "quilt hug." Hang it, so everyone can enjoy the beautiful designs and colours. I would hang according to season. I have always wanted to have a wall where I could rotate quilts. I’d definitely be hanging this quilt so that I could enjoy it every time that I walked into the room. I WILL hang this quilt for all to see! I would display it on our bed (and enjoy snuggling under it), and also hang it on my large antique 4-panel folding quilt rack, or the wall above it. I would probably snuggle under it and also display it. It would definitely be used! Too much work to be abused, it would have to go on the wall. Creating quilts and giving them away has been my goal as a quilter. So I a ask, that when I die, bring back the quilts to see me one more time before I leave this earth. Id hang it on the wall! I would definitely hang it in a safe place for all to see. Ali of time & effort goes into one. I love Jo’s fabric!! !Pick me! Her colors make me happy while I sew. Snuggle, enjoy. Snuggle under it of course!! I would hang it up for everyone to enjoy! I love Jo’s designs and fabric! I would display this quilt for all to see. I love applique I’ve just found that when I get up at 5am for work by the time I have an evening available for stitching my eyes are tired. Summer is my favorite time to do applique…outside in a lawn chair! I would hang this beautiful quilt. Snuggle under it…I like my quilts to be used no matter how much work goes in to it. I would definitely snuggle under it! Quilts are made with love; so soak it all up! I would hang it on the wall for EVERYONE to see. FOREVER!! Hand work is special, display it carefully, and give it to those who would appreciate your time and talent. I think most quilts should be used. I would display AND use! On the bed to snuggle with! I would snuggle under it for sure!!!!! I would definitely hang it on my wall as lovely artwork! Jo Morton’s quilts are all beautiful, no matter what their size. If I were to make this quilt, I’d hang it on the wall, perhaps in our guest room, and eventually give it to our daughter for posterity. Thank you for another wonderful giveaway. I move my quilts about the house, so I would probably put my finished quilt up for special occasions. Lovely, lovely quilts, Jo! I would hang it on the wall for everyone to see. I would hang it on the wall by my front door, so it’s the first thing Everyone see in our home! This is a stunning quilt and I would definitely hang this quilt in my home. Soooooo pretty! I’m torn between hanging it and using it. Maybe put it on display on a quilt ladder so it can still be pulled off when I want to use it? Best of both worlds! I love Jo Morton’s quilts. I can’t wait to see her new book! I would snuggle needs to be used.. The quilt would make a great statement hanging on the wall inside the front door! Like Jo, I would display it, probably for Spring. Looking around my home, I could use a few lighter palette type quilts. This one is simply beautiful. I love to make wall quilts and decorate frequently for the seasons or holidays. It would be a wall hanging for sure. Snuggle under it, of course! I’ll hang it on the wall for everyone to see. What a beauty! I would hang it on the wall so I could enjoy it every day. Then will give it to one of my daughter’s who enjoy handeork. I would definitely snuggle under it! I love the slower work of appliqué and would love to try this…Thanks! Hang it on the wall for EVERYONE to see. Forever and Ever. It’s so nice everyone must take a look on it. GORGEOUS!!! I’ll need to make two quilts, one big enough to snuggle and one for hanging! Beautiful appliqué! I would hang the quilt on the wall where it can be seen right by the front door! I have a wall that is a display area!! Woo Hoo!! Love you quilt designs! Thank you for sharing your talents! If I won I would make a quilt to snuggle under with a good book and a hot cup of tea, all better if there should be snow falling lol. Thanksgiving blessings to one and all! I use my quilts in many ways…snuggling (if the size is right), hanging on the wall, and laying on a table. I love to use my quilts not store them away. I would hang it where everyone entering our home could enjoy it. I would definitely hang it up for all to see! I love Jo Morton and her great fabric collections! Jo Morton is such a talented artist. Her designs need to be appreciated by many. I would make a bed-size quilt and give it to someone who I know will appreciate it. I would put it on my bed and enjoy it every day. Definitely display it on the wall for all to see, it is gorgeous. I would use it gently and happily. Hang it on the wall!!! Not everyone sees my bed, but I’d make sure everyone would see THIS one. I’m really interested in seeing her back-basting technique. I would definitely hang it on the wall. Everyone should see it and marvel. It is so beautiful. I would snuggle under it! I love Jo’s fabrics and am a member of the local Jo’s club. Would love a chance to win.I would hand my quilt. I hang most of my quilts on walls so we can enjoy them. Looking forward to Jo Morton’s new book next year! I do enjoy applique, but haven’t tried the "back basting" method. I would enjoy it and display it for all to see, too! Lovely! thank you! I will use all my quilts from time to time and rotate them. I am known to give away quilts to family members from time to time too. The real joy is in making them but it is also a joy to see the appreciation and smile on the recipients faces. Definitely hang it on my living room wall, her quilt is gorgeous! By making a color change for the border and sashing, I would leave it up year round over the little side buffet in the dining room and add greenery and light accents for December!!! Hang it on the wall for everyone to see! I would hang it on the wall for EVERYONE to see. Forever. I love applique but don’t have a lot of patience with hand work. If I finished it I would be so proud & would want to look at it everyday! First, snuggle; then hang; alternate as needed! I would be using my quilt. Love Jo’s fabric line. I would (will) hang it front and center as you come in the front door above stair railing that goes to the ‘lower level’ of my home for all to enjoy! I would display it for special occasions because all that time consuming handwork deserves to be treated as special. I feel this lovely quilt definitely calls for hanging !! As Jo says she will do when the holidays are over. I totally agree! I would hang it on the wall where everyone could see it! What a great looking book. Love Jo Morton. If I made this gorgeous quilt in my colors, it would hang in a place of honor, FOREVER! I want to try the back basting method stat! Hang it on the wall for EVERYONE to see. Forever. Until I die, then I would leave it to the last person who commented on it! It sure would look better than the sad bow tie quilt I have hanging on my wall now which could go to a new home! I will hang it on the wall over my bed. I am eager to learn the back basting method of applique. Especially applique quilts are hung to be admired mostly by me. If others enjoy them that’s great but I love the style and since I can’t afford to buy the antiques I strive to reproduce them for my health and enjoyment. If I were so lucky to finish the Album quilt and it be as gorgeous as Jo’s, I would do all of the above! I would hang it on the wall for everyone to admire for awhile and then snuggle under and love it. I would also make sure to leave it in my will for someone I know will love it too! I would hang it on the wall. I’d definitely display it on the wall in my living room – after having wrapped it in plastic, of course. I would hang it on the wall for all to see.❤❤❤ It is such a beautiful quilt. I have tried back basting and would enjoy using this technique on this quilt. Just beautiful! Snuggle under it-that’s what quilts are for! Hang on the wall and marvel at it and post pix on all my social media sites. I usually make quilts to snuggle under, but this is so beautiful I might need to hang it on the wall. I think I’d put it on our bed, at least for awhile. After all the work, I’d want to savor the snuggle factor! Then maybe hang it so others could enjoy it! It would be displayed for all to enjoy. But when those times come and I need comfort it would be used. I would definitely showcase this work of art on my wall. I love appliqué ever since learning the back basting method. Love this quilt. Gift to my daughter-in-law, who is able to appreciate historical fiber arts from a contemporary point of view. This is GORGEOUS! Since my bed & couch quilts get used daily by my family (& pets) they need frequent laundering. I would want to protect this quilt by hanging it or I’m afraid it would be quickly worn out! I would hang it on the wall. It’s too beautiful to hide away. I have been a Jo Morton fan forever and have made many of her quilts. This beauty would definitely find a wall to call it home and enjoyed by everyone. ‘Snuggle under it—that’s what quilts are for!’ THANKS for sharing a very nice giveaway! I would hang it on the wall for a time as I rotate quilts. And definitely make sure it goes to someone who appreciates it. I would snuggle under it, and leave it in my will. I love Jo Morton’s fabrics. I want to make a replacement quilt for the bridge over the entry/family room. This is perfect. I love hand applique and have always been curious about the technique. I know I would love this quilt. I would snuggle, or gift it to someone I know would use it. I would definitely hang this quilt on the wall for everyone to see. It is too beautiful to hide away. I would hang it up to enjoy! Love Jo Morton fabrics and also would love to enjoy appliqué. Thanks for the chance! i would take it out for special occasions… leaving it in my will.. for someone in my familly!! I would love the book. I would make the quilt to enjoy it with my family. Thank you for this opportunity. I would definitely hang it so people could see it. I would hang it in my living room to enjoy every day. I love everything about Jo Morton, her books and fabric! I would use it for snuggling under. Snuggle in and use it. Quilts are to be touched and used by everyone. 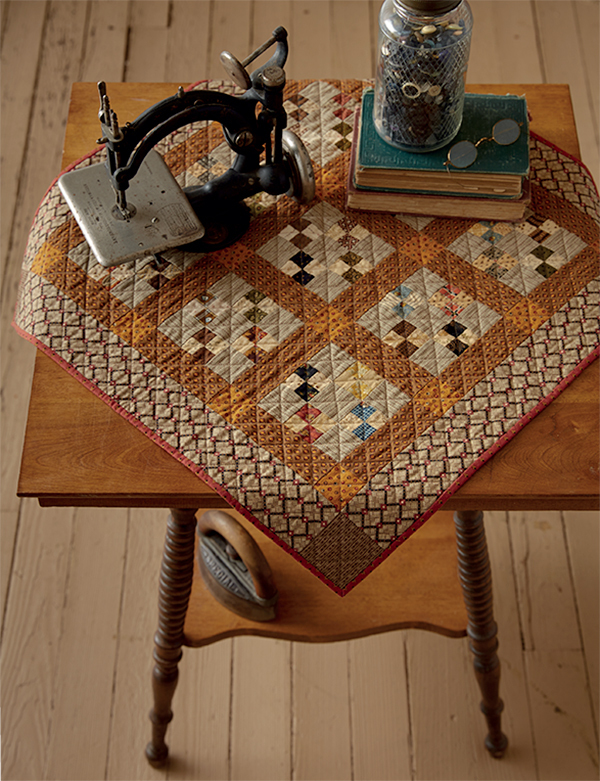 I would love to try the back basting method as I want to start a Baltimore quilt.A wonderful book by a very talented quilter. I would make it for my pleasure but then give it to someone else to snuggle under. I would love this quilt forever, probably first displaying it on a wall and then later snuggling under it. I like when my quilts are used, not hung. I’m happy to hear that Jo Morton makes multi-year quilts just like the rest of us. It would be hard not to snuggle under it, but I would hang it to be appreciated and seen with all it’s gorgeous blocks displayed. I would hang it for everyone to enjoy. Love this quilt!!! I have a blank wall in my dining room that I hang quilts on. This would be a fabulous addition to my collection. This would look beautiful in my living area! Fingers crossed! I would definitely hang the quilt on the wall or display it on a quilt rack! Thanks for the change to win the book and layer cake! I would definitely use it but be careful and then will it to a special somebody! Love the designs and the colors are beautiful! Would either use it or hang it on the wall. When I make something done that I am particularly proud of, I want it on display so I can share it with visitors. Love Jo Morton’s patterns and fabrics. Use a lot of her things in our Civil War Sewing Circle Group, we do a lot of mini’s and are drawn to her patterns. Thanks for the chance to win this wonderful prize. It would depend on the color palette I would use–Fall colors, Christmas colors, Spring colors, etc. If it was seasonal looking I’d either hang it up on a wall or put it on the bed. Decor over cover. I would hang it on the wall to be seen! I would hang the quilt for a few months at a time and be sure my family knows that this one is a treasure. Snuggle under it- That’s what quilts are for! Definitely hang it on the wall for all to admire! Another gorgeous Jo Morton book!! Thank you! I would hang it on the wall, in my office, behind me, so that when ever I was on a video chat for work my team mates could see it. I think this one deserves to hang on the wall for at least a little while! I would hang my quilt for all to see. It is a beautiful design. There is a perfect spot in my main hall to hang this for all to see. It’s lovely! Definitely put it on permanent display, and then leave it to someone very special in my will. I am madly in love with this quilt, so in the unlikely event I tired of it, I could take it down for a while, but I doubt it would not stay down long. What a piece of art! I would hang it up. I have too many grandchildren to leave it down. I would have to hang it in my dinning room for all to see, it would look great in that room. I would hang on the wall just inside my front door for all to see. I would snuggle under it. I love to use the quilts that I make. I’m not sure anyone after me will like them as much as me so I might as well use them. This looks like a great book. I love to do needleturn applique but have not used back basting much and Jo’s fabrics are always delightful :0) Thanks for the chance! I’d hang it on the beautiful oak quilt hanger my husband made for me. I would hang up in my bedroom so I can admire it while stitching my next quilt. I would hang it on the wall for everyone to see. Jo’s work is amazing, as is this quilt. This is such a lovely quilt! While I would love to hang it on my wall to enjoy looking at every day, I would use it to obtain funds for a local charity by auctioning it. I would hang it in a prominent location in my house for all to admire Jo’s beautiful design (and not necessarily my appliqué skills!) I adore Jo Morton’s quilt, designs, fabrics and color palette! I must have this book!! First I sleep under it. No matter whether it’s a quickie or an heirloom that took years to complete, the functionality is always part of the appeal to me. Next I will show it to my son, explain the process and history of its creation and warn him that after I’m gone it will be his, and if it ever ends up as a dog blanket in the back of his truck I will know and will guarantee haunt him! I would hang this beautiful quilt on the wall so I could enjoy it everyday. Such lovely work. I’d hang it in my dining room/sewing room. I’d put it on a couch or a quilt rack. I would definitely hang this one on the wall. Such a beautiful quilt! Thanks for the giveaway! It would look beautiful hung on the wall. I’d find a way of enlarging the quilt by repeating some of the lovely blocks so that it would fit on my bed. I would snuggle under it and plan the next quit. So beautiful, I’d hang it on my family room wall for all to see. Love the colors! After all of the beautiful applique work,it would definitely be hung for every one to see! I would hand it on the wall for everyone to see! I would display the quilt on my living room wall – where I could see it everyday & love it! Everything Jo does is beautiful! Wow beautiful! Gift it to my mum to snuggle under! Thanks for the chance to win! Merry Christmas everyone! I would put it over the back of the couch in winter, and store it during the summer. Quilts are made to be used and enjoyed! Most definitely it would hang fo all to see. I would be so proud that I finished it! Beautiful quilt!! I would snuggle under it inmy living room! I love applique. I would put this beautiful quilt on the wall behind my bed in place of a headboard. I would hang it on the wall! Hang it on the wall. I love to hang my appliqued ones to display their beauty , and Ms. Morton always uses such rich tones that makes you feel the love and warmth in her designs. I would most definitely snuggle under it. My quilts are made to be used! Display it on a table or hang it. I would wrap up in it and keep warm! I would hang it on the wall for everyone to see. But especially so I could see the beauty of the design and fabrics. Snuggle… for sure! This post makes me want to give up my freezer paper forever! Something that pretty deserves to be showe off. I would hang it up. Give it to one of my grand daughters. I am in process of making quilts for all 10 of my grand children. I have 8 more to go! I would definitely hang it on the wall for everyone to see! I would definitely find a great place to hang it for all to see! This quilt is just soooooo beautiful!!! Hang it during warm months and snuggle under when it turns chilly…. I think when first finished I would probably put it some where to be admired. After awhile I would give in and snuggle under it. Hang it on a wall to enjoy everyday. It’s beautiful! If it looked anything like the one in the picture it would go on the wall in between my kitchen and dinning room! Everyone is always in this area of our home. I would want to show it off! I love to live with my quilts by hanging them on the wall and displaying them on my bed. The quilts in this book would be a challenging and beautiful addition to my collection. Love her fabric lines so am positive her book would be fantabulous! I would hang it and leave it to my daughter in my will! I would hang it up for everyone to see. Thanks for the chance. I think the snuggle would be first instinct but the inner voice of me says display and enjoy it along with others. The book looks fascinating. I would alternate between snuggling and draping it where it would be seen daily. That is such a pretty quilt. I can’t wait to make one! I would definitely snuggle under it, but after that, if anyone wants it, they are welcome to it. If I made a quilt like this I would definitely want to hang it on the wall for everyone to see. Forever. It would definitely hang on the wall so all could see! Beautiful! I like to display my quilts where I can look at them. This is a beautiful quilt! I enjoy doing hand applique, so I am definitely interested in this one. I would love to learn her technique and show it proudly, in my home. I would hand it on the wall and look at it everyday! Making this quilt would be a labour of love and the finished quilt would be hung in a place of honour to be enjoyed every day! If I was ever able to accomplish making a quilt like that, it would definitely be hung on the wall so everyone could see it. I would hang it on the wall in my living room and consider it a treasure that would be mentioned in my will. Love love love the fabric and the book! Have been a fan of Jo’s. I would definitely hug this quilt and then display for all to see and protect it from harm. The colors would look lovely in our home! Wall. No other choice for sure. Spectacular! I would hang (to admire), snuggle under it on stressful days (when an ordinary quilt just won’t do) and make sure to pass it on to someone who will love it as much as me! I would display it on the wall or the top of my guest bed and then leave it in my will to my daughter who would appreciate it! I would cherish it for a few years and then give it to someone who admired it. It’s so hard to immediately part with a project that has taken years to do. This would take me years!! That is worthy of display, but I would use it with joy. For sure! Am curious about her method of appliqué! Hang it on the wall for awhile for everyone to see, then snuggle under it! Love all of Jo Morton’s quilts! Yes of course I would love to make this quilt and hang it in a special place in my home. As I have 4 grown children I would have to consider who would love it the most to cherish in their own home someday. I do traditional hand applique and would love to try this back-basting method. Thanks for the giveaway! I would hang it on the wall for everyone to see as it would be quite an accomplishment to make such a gorgeous quilt. I love her patterns and fabrics! I would enjoy each stitch for I am crazy about back basting and then would hand quilt it. Then I would give it to my beloved friend, Miss Haze,l who has been like a second mother to me through the years. Colgarlo en la pared para que todos los ver siempre. Saludos. I would put it on display for special occasions; then leave it in my will for someone who will appreciate it. I would want people to see it but I wouldn’t want any damage to come to it. I would leave it out all the time so everyone could look at it. I have the perfect wall to hang it on in the bedroom. What a great win that will be for somebody! I would hang it on a wall. I am seeing this as a wool on cotton quilt. Definitely use it! We use to save them and they just sat and collected. That’s what they’re there for, so just use them! Plus they get a used patina that looks great! Normally I would say snuggle under it , but this would be the exception for me. While I believe that all quilts are works of art, I would say this one is exceptional, so I would hang it on the wall for all to see! I’d hang it on the wall, though I might have to take something down first to make room! I would hang it on the wall to admire – the designs are beautiful! I would love to make this gorgeous quilt and hang it to display proudly. And I would be sure to will it to a favorite someone in the future. I would hang mine on the wall, if I finished it! I would put it on display for everyone to see, and also leave it in my will for that special grandchild. I would hang it on the wall for EVERYONE to see. Forever. And as well, will it to my daughter! You’re assuming that I would actually finish it? Hahahaha! OK, well, assuming that I DID manage to finish it, I would be so proud that I would hang it on my wall for everyone to see. I would display my quilt so that I could see it every day and also share it with others who came to visit me! I would hang it somewhere where I could look at it every day!!! Beautiful! After I have it completed I would display it in my living room for everyone to see. Love Jo’s work! I am a traditionalist. Quilts are to be used. Except for those gorgeous art quilts with thousands of hours in them. I would hang my quilt up. I hang my quilts all over the house! I would hang it for everyone to see. Probably forever. Once I hang my work my husband never wants to take it down. Oh, I’m thinking this one would be draped over the back of my couch – so mostly for display, but on hand for the times when a cozy feeling is needed. Hang it in the wall and marvel at it as I walked by it every day that I could actually make something this nice! I would definitely hang it on a wall where I could see it and enjoy it daily. Once I got tired of looking at it everyday, as if that would ever happen, I would then snuggle under it while watching my favorite Hallmark movie! I would definitely hang this stunning floral album quilt on the wall! Hang it up for all to enjoy! I would display it in our guild Quilt Show in September 2018 and then display it in my home. I would hang it on the wall so it could be admired every day. Thank you for the giveaway. Hang it on the wall! It is fabulous. I never hang my quilts I either snuggle or give them away. They are beautiful! Put it on display but for many occasions and it would definitely be left to someone ( daughter’ or Granddaughter )who would cherish it. I really need to learn how to do appliqué! I would hang it for all to see, since I finally would be learning an easier and better way to applique. I really need the lesson. I’ve never really been happy with my applique attempts. Maybe this method is what I need. The fabric is fabulous, too. I’d put it in my grand-daughter’s treasure chest for when she starts her own home! WOW have been waiting for a book like this. Love Jo’s work and fabric. I would hang my quilt for sure and enjoy. If I had an Album quilt, I would keep it hanging on the wall. I have several walls that that could easily hold a quilt like that. That way, everyone that came to our home could see it. I would use it! Love quilts to be used! thanks! I would make it,photograph it for posterity, and then donate for our local cancer auction. Put the quilt out for special occasions. Leave it to someone who will appreciate the quilt. It is beautiful. I’d have it in our family room to keep us warm. Love appliqué and your fabrics. I would give it to someone for Christmas. I love to hang my quilts on walls so everyone can see them. Snuggle. They get softer over time! I would hang it on the wall for EVERYONE to see. Forever. When I look at it I will be reminded of how much I enjoy the process as well as the end product! I would definitely hang it on a wall forever for all to see. Too pretty to take down! I would hang it on the wall so everyone can enjoy it, including myself! Thanks for a chance. It would be on my wall for everyone to see. Forever for sure. Hope I win the book, but if not, I’m buying it. Thanks for the chance. Hang it for everyone to see! Then use is!!! It would be hung on the wall. I like the idea of 8″ blocks, challenging but beautiful. I would hang it on the wall for all to see that I actually finished it. I would probably leave it to my oldest granddaughter as she would appreciate the time and care I put into the quilt. I would hang on the wall for everyone to enjoy! I love hanging my applique quilts on the wall as art! Hang it on the wall for everyone to see!!! Will have to check her book out to learn her technique. Thank you for the giveaway! I am always drawn to hand work especially appliqué, and learning new method to try sounds like just what I need to have the confidence to try and make a beautiful quilt. The colors in the fabric look so warm and homey they would be lovely to work with. Thank you for chance to win. I love Jo Morton’s work. Have most of her books. Working on last block of current appliqué project so soon will need a new project. I would put it on display for special occasions; then leave it in my will for someone who will appreciate it. I am 77 years old so am aware of who gets what. Keep my old bones warm. Snuggle under it! !- that is what quilts are for! I would hang it so I could enjoy it every day! Definitely hang it on the wall, if it looked as beautiful as Jo’s I would want to admire it daily!! I love the look of appliqué but so far have found the though of trying it pretty daunting. Would love to try it by following Jo’s instructions and put it up for all to enjoy. I would also like to hand it down as a family heirloom. I rotate my quilts depending on the season, so this quilt would definitely be used. As far as willing it to someone, my daughter is always happy to take any quilt I gift her. I would hang it for everyone to see- it’s a quilt that everyone should be able to enjoy!! I love for Quilts to be seen and used. It all starts in the quilt shop, being able to see and touch the fabric. You bring it home and sometimes it can be hard to cut into that amazing yardage. But the process of cutting, piecing and quilting all comes together for a wonderful end result, one you can keep or share with others. After all that work, I would hang the finished quilt so I could see all those beautiful colors every day! This gorgeous quilt deserves to be on display. My first impulse is to use it to snuggle but I am sure it would end up hanging at least for a little while. Hang it on the wall for EVERYONE to see. Forever. FOREVER!!! I would snuggle under the quilt. Love the flowers! I would hang my quilt and than have to make a new to give away! So pretty! I would give it to my best friend of over 50 years as she has a heart of gold and does so much for others. She will be 70 soon and it would be a lovely present and surprise for her. Hang in my dining room for all to admire while eating a great holiday meal! On the wall! I have 1 wall on my living room that is a great display place. I change them frequently! I would definitely hang it in my front room for all my family to enjoy. I would hang it in my foyer and everyone would see it each time they came to visit. I would hang this beautiful quilt for all the world to see! Snuggle under it–that’s what quilts are for! At least that’s what I think I would do. Since I’ve never made one, maybe my mind would change as I quilt it! An album quilt is definitely one to display! I learned needle turn a few years back and have heard of back basting but don’t know much about it. Maybe this book will turn me on to it since I’ve always admired Jo’s quilts! Would have to put this one out for special occasions and leave it in my will for someone super special… my daughter or grandaughter! I like to use my quilts so they either go on the bed or at the end of the bed or on a chair! Its cold here in Minnesota! We need our quits to stay warm! The pattern and fabric is gorgeous, love reproduction quilts! Hang it on a wall so I could look at it everyday! Hang it in the wall in my living room. Love the design and the fabric. On the wall, definitely! I am drooling over both the book and the fabric. Yum! I would display it . I love applique quilts! Stunning quilt. I would hang it on my bedroom wall for spring and summer. I would will it to my sister. She would absolutely love it. I would display it in my living room, for us to snuggle under! Best of both, lol. Hang on the wall so I could admire my work, the fabric, and the pattern. I don’t have many quilts finished so definitely snuggle under one! Love Jo’s Floral Album Quilt! I would definitely hang it on the wall for everyone to enjoy. I would hang it on the wall with pride. Hang it on the wall for everyone to see!!!! This would definitely be "my quilt". I would snuggle under it and display it in a prominent place when I was not under it. Through my will I would pass it on to my daughter as she would appreciate everything about it. Thanks for sharing and offering a giveaway. I would hang my quilt on a wall for everyone to see and admire. I would definitely hang it on the wall for all to see but later would also make sure it was given to someone who would appreciate it. Hang it on display for everyone to see ALL the time ! Learned to appliqué and am very interested in learning this method you say I’d in the book! I would hang this gorgeous quilt on the wall and enjoy looking at it every day. I’d hang it on the wall in my new dining room! I would hang it on a wall where I can see it everyday! First I would have it on MY bed while I marvel at the skill I mastered, the patience I learned while completing this beauty! Then it would directly across the room from my favorite chair so I would see it every time I entered the room and my family could marvel at the beauty created by mom in the sewing room she lives to work in. I have started many of the appliqué blocks in Jo’s other great books. I must admit I have NOT mastered back basting🙁. But I still have hope! Another great Jo book for inspiration and pleasure. That quilt is a work of art – I’d definitely hang it on the wall over my bed. Thank you for this opportunity!! I woukd display it. I would give it to my mom to hang on her wall. OH my, what a beautiful quilt! I have always admired "album" quilts but I have yet to make one. I would definitely display my quilt on the wall for everyone to see. It would hang on the wall to remind me daily that if I could do work like that, anything would be creatively possible. Snuggle under it—- that’s what quilts are for! If I completed it I would definitely hang it for all the world to see! I love this quilt and am very curious to read about this new (to me) appliqué technique! Definitely making this and will put it on either my own bed or a frequently-used guest bed ~ won’t put it away as I’ll love to use and enjoy such beauty! Wow, great inspiration. I would make it a wall hanging. The applique needs to be shown. Thanks. I’d love to make a wall hanging! I would hang the quilt on the wall! Back basting will be on my list to try this winter, thanks for the inspiration. If I finished a Jo applique quilt, I would hang it up for all to see. Love it. I think the quilt is stunning and I would love to display it in my den hanging over my antique washstand. I would drape it over my burgandy leather wing chair. The colors and style would be perfect! I would put it on display on special occasions and definitely put it in my will for someone who I know will appreciate it. I tried , I think this method a number of years ago. A friend of mine used this method (or at least one that sounds like the same). I have not used it – without the teacher I was lost. Jo’s book is one that I would like to own so I hope I win that round. Hang it on the wall for EVERYONE to see. Forever and ever. It is such a beautiful quilt. Snuggle under it, that’s what quilts are for. I make quilts to be used, snuggling and feeling the love sewed into them. Each time someone snuggles under one of my quilts they are getting a hug from me. I would give it to my nephew who is getting married next year. I think it would make a wonderful wedding present. I love Jo’s new appliqué book, the quilt is stunning! I would hang my quilt on the wall for all to see and enjoy! Super giveaway! Thanks for the chance to win. Fingers crossed, hehe. I would hang it on the wall. Beautiful design. I would have it on my chair back and cuddle underneath it when the weather is nippy. Also very interested in learning Jo’s back basting method. Beautiful quilt, I would hang it so that it could be enjoyed by everyone. If I finished a quilt like that it would be hung on a very prominent wall in my home! I would hang it on the wall. What a beautiful quilt! Oh my goodness, what a beautiful quilt! I would definitely hang it on a wall, so my family, guests and I could see it each and every day. Hang it so everyone including me can see and enjoy it every time it is seem! I would hang it on the wall! I would be able to enjoy it everyday! I would also make sure that when I am gone, it would go to someone who would treasure it! I would definitely hang it so I could enjoy seeing this beautiful quilt. I’m sure anyone visiting would appreciate the beauty of Jo’s lovely quilt. I would use–I like practical quilts. That said, they can be beautiful also. I have the perfect spot, above the sofa on a quilt hanger that my husband made. The focal point of our living room. I have a wall space that is just made for that size. I would put it up for spring and summer. I love it! I have always wanted to make a Baltimore quilt but being a relatively new quilter it seems like a bit more of a challenge than I might be ready for. This quilt looks like the perfect starting point for me. Absolutely breathtaking!! I would definitely hang this quilt for all to see. It is really lovely. Jo has such a wonderful sense of color and her fabrics make coordinating so easy. I love doing appliqué and would display this quilt in my living room but not on the wall – no room there. I love Jo’s quilts and make many of them. She makes the most adorable quilts. I have admired your work and fabric designs for a very long time. Gorgeous. I would enjoy using your fabrics in a quilt. I would put it on display from time to time. Each time it would come out, it would be a special treat! I would hang it in my sewing area to remind me that I can conquer even the hardest piecing ‘hiooup’ and that patience has it’s rewards. Snuggle under it. That’s what quilts are for. I would snuggle, hang and share on special occasions. What a treasure. Hi, I love this chance to win, as I would make this beautiful quilt and hang it on the wall for everyone to see! I would hang it on the wall but also switch it out for other quilts I’ve made. Enjoy making it then donate it to hospice as a fund raiser for them. Display my quilt where I will see it everyday. Hang it on the wall And save it as an heirloom! And make another in bright colors for my grandchildren! Hang it on the wall of course! I’m in the process of making “my legacy quilts” for those I love. I make them, label them for loved ones and package them safely. When they are all completed, I will distributed them at one time so nobody feels slighted. I would gather a couple quilting friends to help make it….we would share it….each to use or display to our liking. It’s beautiful!! I would bring it out for special occasions and then someday leave it in my will for one of my dear ones to enjoy. Just love the look of applique ,I would love to see it on the wall in my living area . Snuggling under a quilt always gives me that sense of warmth and security. Snuggle, snuggle, snuggle then give it away. hang it on the wall, for everyone to see. I would absolutely put it on display on special occasions and leave it in my will for someone who would appreciate it. Thanks! Oh my, I would hang it where I’d proudly see it and marvel over it’s beauty. I need to hone my applique skills, this would do it. It’s just gorgeous! I would hang it on the wall for everyone to see and so that I could look at it every day. Love it! I would hang it seasonally–it’s a great spring/summer quilt. Use as cover for bed and enjoy every day! I would hang mine on the wall for everyone to see. Hang it on the wall for EVERYONE to see, forever. Of course, I would snuggle snuggle under it! This is such a lovely quilt, I think I would probably have it on our bed, to be comforted by it on a daily basis. I’d hang it on the wall! Absolutely hang it on the wall! Too pretty not to look at every day! I would use the quilt on my own bed. I love Jo’s fabric and patterns. Make it for my daughter as another special quilt for her. Gorgeous patterns and lovely applique. I would use it to decorate the end of the bed and use it for nap time! Although I typically use my quilts, when & if I ever finish a hand-appliqued quilt I would have to hang it up and admire it for a while!! Put in my living room so I could enjoy it’s beauty and snuggle under it with my grandchildren! Thank you! I would hang it for sure, but seasonally like Jo. Snuggle under it. It looks absolutely lovely. This would hang on the wall in my family room where I could see it every day. It’s stunning! Use it! Love the book and fabric colors! I would probably display it. I probably snuggle under it, I love that. Or put it on my bed and enjoy it every morning and evening. I would definately hang it on a wall for me to see every day as well as those who visited my home. I will hang it on the wall. On the wall, of course. If mine looks nearly as beautiful as Jo’s, I’d hang it on the wall. Thank you for the giveaway! Hang it for all to see. Hang it on the wall for all to see. Definitely hang it for everyone to see!!! Love applique! I would hang it on the wall, then snuggle under it and finally will it in the end! If I finished all that applique I wouldn’t want anyone to touch it. Display only. First I’d stare at it for hours, not really believing I’d completed something so pretty. I would hang it for all to enjoy or put it on the bed in our guest bedroom to welcome our friends and family! Hang it on the wall for everyone to admire. Take in all the compliments. That’s what it would be for me. Quilts are made to be seen definitely. Thanks for the giveaway. The muted soft colors in this quilt are gorgeous. Although, I love the Civil War reproductions, I find some of them to be a little dark for me. After purchasing fabrics for the entire quilt, I would applique a block a month and would like to use it as an applique class. After quilting with a wool batt, I would relish this quilt as our ancestors did by using it every night as a quilt, quilted with wool And, it would be a beautiful utilitarian quilt by day on my made bed. I would donate that quilt to a quilt museum. It is definitely a museum quality quilt, outstanding and beautiful! I would definitely hang it on the wall. It’s just the right size for that plus it is absolutely gorgeous. I would love to learn her applique method although I like my own as well and don’t know if I could change after years of doing it ‘my way’. A lovely quilt like that should be diplayed on a wall in my/your living room or at least at a place where I can look at it often. I would never give it away. I’d hang it up for awhile, but sooner or later I’d probably snuggle in it too. A quilt this beautiful would have to go up on the wall. Love the rich colors and detailed fabrics. I am from Indep. Mo. Your quilt would make a beautiful wall quilt. I would hang the quilt. It is just beautiful….a work of art. ALL OF THE ABOVE! I love all of the Jo Morton designs. Pieced and appliqued quilts with Reproduction fabrics are also my favorites. There is just not enough time to do all the quilts I would like to make! Keep up the great job of supplying us with inspiration and books. I would hang this beauty for all to see. I’d snuggle under the quilt but only after I designated in my will who would get this beauty after I can no longer enjoy it. I would definitely hang it on the wall! It is so beautiful. I would hang it on a wall! It’s too beautiful to be used. I would definitely put the quilt on my bed and snuggle under it. I’d love to learn a method to applique that doesn’t leave me once I’ve left it for a while. It would definitely hang on my wall..I love to hang my quilts it makes every room feel so cozy and warm. I had the good fortune to go to one of Jo’s retreats several years ago and it was so much fun. 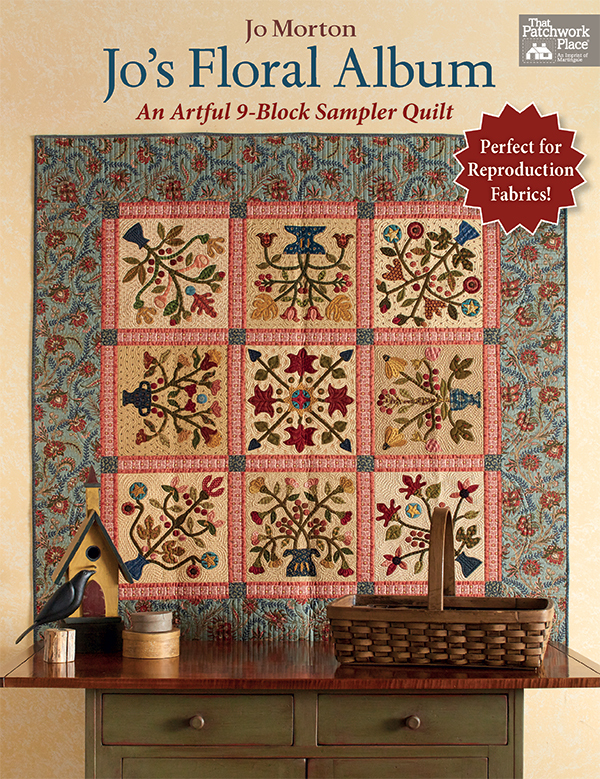 Applique has been my choice for making quilts for many years, and I would treasure her new book.. I would make one, to cuddle up with, for me. Then I’d make one for my daughter and one each for my three granddaughters. They’d all have to be in different colours! Treasures like this quilt would take a while to make then be admired and cherished forever. I would snuggle under it, immediately. Then put it on the guest bedroom, for special guests to snuggle under, so they would know we love having them here. I love all of Jo’s books and have them all! I would make this one for my living room wall where I could see it all the time! It is lovely…as all of her quilts are! I would enjoy and appreciate the amount of time and patience it would take to finish the project and then, hand it down to my family as a treasured moments of mom’s loveing craft. If I finish the quilt with succes, I hang it on the wall. I would love to snuggle under one of these quilts. Also like to hang them on my wall on a quilt rack that my husband made for me. I would hang it for everyone to enjoy. I need help perfecting my applique before attempting this quilt so the book would be a great help. I would hang the quilt so I could enjoy it every day, then pass it on to my daughter. I have always admired applique quilts and have had this on my bucket list forever. I love, love, love Jo Morton and her designs. This book looks fabulous. This would make a cherished heirloom. If I did that much applique it would be on display forever! Snuggle under it….enjoy making quilts for others. However, would love to treat myself! Thank you for this giveaway opportunity. It would be displayed on the wall for all to see! This is simply gorgeous! Thanks for the giveaway opportunity. I would hang it on the wall since it would be a special work of art quilt. I would definitely display it for all to admire. I would snuggle under it! I would hang it up for daily inspiration from quilters of the past..tanks for designing this, Jo! I believe all quilts need to be loved and enjoyed… so definitely to cuddle up underneath! I would display it on a wall for all to enjoy and pass it along to be cherished as a family heirloom! I’ve only dabbled in applique and would love to learn this method. I would hang it at the end of my hall for the world to see!!! It’s gorgeous! why not show it off! I would display it for a time then pass it along to that special someone. It’s a quilt to cherish! I would hang it on a wall for all to see AFTER I took it to my quilt guilds for Show n’ Tell!! I want to learn this technique!! Looking at it on a wall would be my choice. Such a work of art. I would be snuggling under it. This is a beautiful quilt. This book cover quilt is absolutely beautiful. Would love to try it. Snuggle under it for sure. Snuggle. If I’m going to make it, I’m going to use it. I love making and collecting ideas from other quilters. I especially love surprising people with a quilt gift at work and watching their expressions. I really love the old style colors and designs that Jo makes. You can never collect enough ideas! Something about just seeing that makes me warm. It’s a technique that I’d love to learn. I would display it and then give it to my daughter. Thanks for the kind offer. I would hang it on the wall!! Love anything that Jo Morton does and I really love reproduction fabric!! Jo’s patterns are fun too make and her fabric is beautiful. This would be a treasure. I would derfinately make a wall hanging but more like a long banner I think would be cool. Great work. I would hang it up so everyone could see it. This would be such a learning experience for me since I haven’t done applique…yet. I love the oModa fabric too. Snuggle under it. I think quilts are made to be used! Thanks! I would love to hang my quilt made using Jo’s pattern on my wall. Love her colors and patterns. I am working on another, less complex, Jo Morton applique quilt that will be a good practice for this one, which is even lovelier. I will display the album quilt on my dining table – but not when we are eating off that table! I would hang it on the wall in the bedroom so it is the first thing I see when I get up in the morning! Hang it on a wall for everyone to enjoy. I would love to make this quilt. Thanks for the giveawy. Always wanted to make an Album quilt, and this one inspires me very much! Once completed, this quilt will hang in my great room to enjoy everyday…aaannnndddd, I would have my insurance agent insure this one. This will be one item my heirs can fight over –LOL! I would have to hang it for everyone to see forever. Thanks for the chance to win. Display the beautiful design as a qall quilt to share it with others. I would display it everyday and make certain that the wall I chose did not get any direct sunlight. I like to display my "special" quilts. Im taking a Halloween one down and putting a Xmas one up to hang for a few months. Tomorrow’s project. I will put them in my will. I would put my quilt on the guest bed so it could be occasionally enjoyed but not worn out! I like to sleep under my quilts. What beautiful patterns! Another winner from jo morton. I would have it on display and take an occasional dreamy nap under it!! I would definitely hang it on the wall for everyone to admire! Hang it on the wall for all to see! Any quilt with this much fine stitching needs to be on display. This quilt would have the place of honor in my wall quilt gallery. I usually change quilts with the seasons, but it would be difficult to take this one down! Jo’s quilts are quilts to be hugged and loved. They are what I call "Feel Good Quilts" because they make us feel so good whether on the bed or the wall! I’d definitely hang it on the wall. I love quilted wallhangings. I have the perfect spot on my wall where I would hang the quilt. It would hang in pride of place to share with family and friends. Truely a work of art. Then I would have to learn the technique so as to be able to leave each of my children (I have four) one of your fabulous quilts. I would hang it on a wall. I generally make quilts that are meant to be used, but that one is so pretty I would need to conserve it! I love this quilt as I love all of Jo Mortons’ quilts. So reflects a warm home. I am 75 and would make this quilt to leave to my children along with others that have been made and neatly put away or hung for them to enjoy now and as a remembrance for later. Quilts so reflect our love of home and family. thanks again Jo for a wonderful project made just for this purpose. I believe quilts are to be used. However, this type of quilt is definitely one to be hung proudly. Thanks! Use it! Then give to a family member. Display or snuggle since I have no free place to hang the quilt. It is beautiful. Can I make this quilt is the question. Thanks for the giveaway. I have never made a quilt to be displayed. This could be my first. Hang it in my living room, and leave it to someone that would enjoy and appreciate it….Love your work Jo…. I would definitely hang it on a wall. I’d hang it up for me to enjoy! A quilt this special and time intensive should be displayed for others to enjoy. i would definitely hang it on the wall. All that applique deserves to be seen by all and sundry. Snuggle .. that is what I always want for my quilts .. the quilts are beautiful .. ! It would be displayed in the dining room seasonally. That is what I do with my favorite quilts. I would snuggle, hang and leave this beautiful quilt to someone worthy. I’d hang it in my bedroom,to bring me endless joy in looking what I had created with your guidance. You are a fabulous textile artist whom inspires and surprises me with your vision and enthusiasm. Ty for what I am sure will be another great teaching book! While I use all my quilts and give them away. A handpieced quilt of such gorgeousness would go on my wall to be treasured by all. Thanks. Hang it on the wall forever. After all that work, it needs to be displayed. Likewise, after all that work, I’d hate to see it laundered over and over after daily use. I would love to hang it on my wall. I love fabric, so for me making a quilt is the fun of working with the fabric, making a quilt and then give it away to the person that comes to mind when I am working on the quilt. My favorite quilt is appliquéd and that is the only one I kept for myself. Wow, what a beauty. I would definitely have to display this on a wall and another for my bed. I would hang it for a long time, then later snuggle under it. This appliqué is so beautiful. I would hang it on a wall so I could enjoy seeing it all the time. Use it to keep warm and also display it on back of couch. Love Jo Morton’s work! I would hang it on the wall. It would be a perfect addition to my home that features my love of all things quilted!!! I would hang the quilt on the wall so that I (and anyone else who is interested) could enjoy it on a daily basis. Jo’s designs just speak to my heart and I have a significant collection that I use both as is and as inspiration. My daughter has threatened to walk off with my quilts and if I ask, she will just say that I am getting old and senile and don’t remember what I did with them. Obviously she shares my choice of fabric and design. I would show my husband that even "old" fabrics can be warm and comforting in the decor. 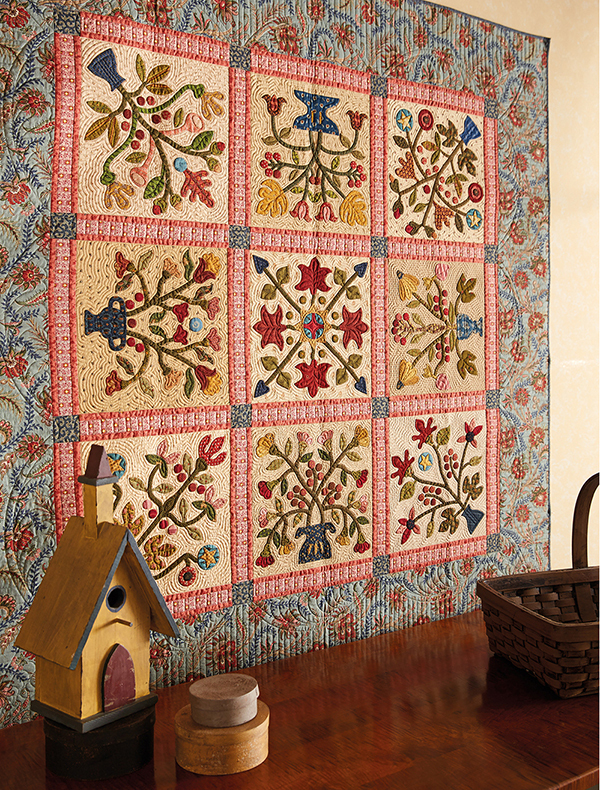 I would hang my appliqued quilt on the wall for all to enjoy! Applique is something I admire and would love to try so a finished quilt would be an accomplishment! I love quilts displayed on a bed. I would use it for special occasions, probably as a bedspread. I would snuggle some, gift some and display some. Hang it on the wall to enjoy it. I would hang it on a wall for everyone to see. Thanks. showcase? not sure if I would dare let it be used with all that work into it! but if I saved it, like Mom did so many things that we found after her death, and never let it be used, there would be no good memories to go with it, so best to use it, eh? so SNUGGLE is the answer! I would definitely put it on display! Display it and put it on my website for everyone to see! I would love to take on this challenge. Lovely quilt! Display it, but not where the sun hits it! This is a lovely give away. Thanks for the chance of winning it. I love, love, love applique and usually hang finished quilts for all to enjoy. If back basting is the trick to stress-free applique, I just might be able to finish a beautiful quilt such as this. I am torn – to display or use. Will have to make that decision when it is completed. Would love to win the book and fabric. Definitely, SNUGGLE under it. That is what quilts are fore. Saving for someone??? ?Who may not appreciate them and then they end up who knows where…. I sleep under mine or give to family member. I love hand applique but hate fighting freezer paper. This book is at the top of my Christmas list. If I had this quilt, it would hang on the wall over my couch so I could see it everyday! A quilt this beautiful would definitely be hung on the wall! I would hang it in my newly remodeled living room and use it for inspiration for my church ladies to maybe start our own quilt club. I’d love to make this. I think I would hang it in the living room with the curtains open so everyone can see it. I would hang mine on a wall for everyone to see it. Hang it on the wall for everyone to see! I’d be so very proud!! I would snuggle under it plus it would be incentive to make my bed so I could admire during the day. I would cherish this quilt book and fabric, along with the others I have that Jo Morton has written and designed. absolutely hang it on the wall. I would drape it over a sofa for all to enjoy. And take it on quilt retreats to put on my bed……I just luv Jo’s stuff. I would use it to snuggle under while watching old movies or reading a good book. I would also make a matching pillow out of one of the blocks. This is so beautiful, I believe I would hang this on a wall. Having the privilege of meeting Jo in person and learning from her first hand,I love seeing a new book and would love to make another wonderful creation to hang on my wall. You have another hit Jo. Great job. I would have to use it as a wall hanging so that I could show it off. Enjoy, enjoy, enjoy! Enjoy making it, enjoy admiring it and enjoy using it! Wow! I would definitely hang it on the wall for all to enjoy. Hard choices, but most likely hang to display because of the intricate work.